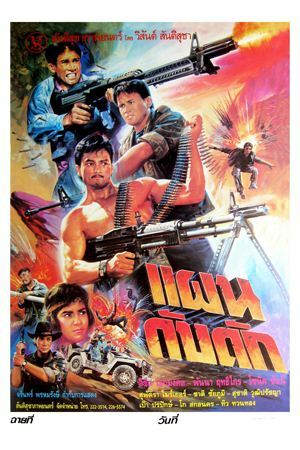 Thai full action movie แผนกับดัก was released in year 1991 and lasts 1h26mn. The movie is also called หักเหลี่ยมพระกาฬ. Two groups of ruffians meet to exchange drugs and money. Phayut, seconded by Chat (Panna Rittikrai), decides to betray his partner in order to keep the money and drugs. The partner’s son, Keng, and daughter, Nat, wish to revenge their father's death but fail as there are only two. Phayut uses one of his men as a bait to fool the police. As his man is arrested, Phayut asks police inspector (สารวัตร) Likit (Likit Eakmongkol) to release the accused (ผู้ต้องหา) but Likit refuses. During the prisoner transfer, ruffians kill policemen and Phayut shots himself his man causing Chat's disapproval. A lady calls Likit as she wishes to provide information to him. This is a trap to accuse him to receive dirty money (รับสินบน). Likit has to leave Police temporarily in order to clean his name. Likit, Nat and Keng decide to unite against Phayut. Asulaman, a Philippines citizen, is looking for drugs but the deal fails to succeed. Chat warns Phayut that he doesn’t like his way of working anymore (ไม่ชอบคนหากหลัง) and leaves the team. Phayut hires a hitman (โซนิค ซันนี่) to get rid of Chat and Likit. The hitman fails and finally joins Likit's team. Phayut kidnaps Asulaman to show him he is not as bad as rumours said (อย่าเล่นสกปรกอีกก็แล้วกัน). Chat and Likit guess it is another trick. Shootings happen but Phayut succeeds to flee. The hitman is captured but a policeman (หมวด) comes to help also. The team prepares a plan against Phayut (แผนกับดัก). Phayut ask support from other ruffians (โจรป่า). Shootings involving heavy machine gun happen but final fights are one to one fightings. Nat revenges her father by taking care directly of Phayut. Ruffians are defeated. Likit is finally reintegrated in the police. It is a low budget movie. Likit Eakmongkol is the main actor but all main fighting scenes are featured by Panna Rittikrai. Such movie has no direct sound recorded but the film was dubbed after. Additional funny words especially for second roles are added during post production and are a reminder of the famous dubbers activities in 1960s and 1970s. So for such 1990s production there was no more live dubbing but post dubbing.